Over 40 ? – when did you run last….. try running 20 meters – are you breathing fast ?? 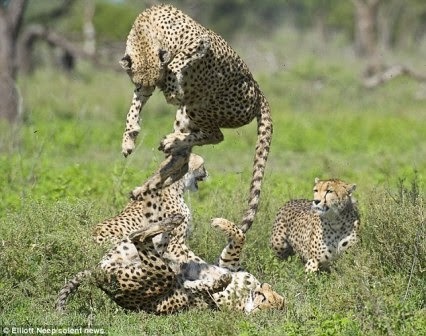 – when you think of running – the one comes to mind readily is ‘the horse’….and the ‘cheetah’….. In the recent hit ‘Kalakalappu’, a comedy film directed by Sundar C ~ Santhanam will show a portrait of a man attacking a cheetah with sickle. Hero Vimal would remark having seen it elsewhere… Santhanam retorts saying that it was his grandfather attacking the tiger – the photo which they later gave to matchbox manufacturer….. to Vimal’s remark that it does not sound believable – Santhanam would say that his grandfather told him that food would be provided only if he believes and would ask Vimal whether he would like to dine !!! Wimco Limited is a reputed manufacturer and exporter of Cardboard matches, Veneer Matches, Safety Matches, Match Box, Wax Matches and the more… you would know them better by this single product ‘Cheetah fight matchboxes’….. The horse - is an odd-toed ungulate mammal which evolved over the past 45 to 55 million years from a small multi-toed creature into the large, single-toed animal of today. Humans began to domesticate horses around 4000 BC, and their domestication is believed to have been widespread by 3000 BC. There are too little of wild horses and rest are called feral horses. There is an extensive, specialized vocabulary used to describe equine-related concepts, covering everything from anatomy to life stages, size, colors, markings, breeds, locomotion, and behavior. The way of its running described as gait - in increasing order of speed is known as : walk, trot, canter, and gallop. When we think of human, it is ‘Usain Bolt’ all the way…. ~the Jamaican sprinter is regarded as the fastest person ever. He is the first man to hold both the 100 metres and 200 metres world records since fully automatic time measurements became mandatory in 1977. Along with his teammates, he also set the world record in the 4×100 metres relay. He is the reigning Olympic champion in these three events, the first man to win six Olympic gold medals in sprinting, and an eight-time World champion. The fastest man on earth, Usain Bolt, raced against a Buenos Aires bus, won comfortably and spoke of his desire to defend his titles in the Rio Olympics. The automotive proved no match for the world's fastest man, with the six-time Olympic champion easily outrunning the machine in an 80m exhibition race. 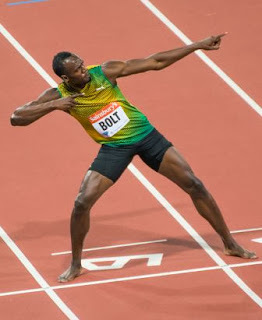 It is reported that Bolt barely broke a sweat as he outpaced the bus before a crowd of 30,000 spectators. The video shows him cantering easily, returning back to see the bus behind and running casually. Reports state that he shook the defeated driver's hand before pulling his trademark pose. Bolt was in Buenos Aires to hold a coaching clinic for disadvantaged children. After beating the bus, Bolt raced a 120-metre sprint against fellow Jamaicans Mario Forsythe, Kimmari Roach and Daniel Bailey ~ and no need to write that he won that too……….. Meantime Google made more news buying the Company behind the robot that can run faster than Usain Bolt; this reportedly is the eighth robotics company that the search engine has bought in the last six months. Google announced the purchase of Boston Dynamics, a company that builds military robots - though no one knows what the search engine has planned for the cyborgs. Daily mail reports that up until their purchase by Google, Boston Dynamics was making research robots for the Defense Adanvanced Research Projects Agency (DARPA), the U.S. government agency responsibly for developing new military technologies. Boston Dynamics was founded in Waltham, Massachusetts by ex-MIT professor Dr Marc Raibert in 1992. Since then, they have been developing animal-like robots that can travel faster than the fastest human, and even cover difficult terrains like snowy hills and icy roads. The Boston Dynamics robot named Big Dog can cover all types of terrain, and is pictured maintaining balance even on a sheet of ice. The robot named Cheetah can run one mile per hour quicker than the world's fastest sprinter, gold-medal Olympian Usain Bolt. One of the projects they're currently working on for DARPA is the creation of a robot that can operate in a natural disaster, like the nuclear power plant meltown in Fukushima, Japan. The robot named 'Cheetah' was designed for maximum speed, and was filmed running on a treadmill at speeds up to 29mph which is one mph faster than the world's fastest man - Jamaican sprinter Usain Bolt. That beat the previous record of 13.1 set by a robot in 1999. The robot named Big Dog can climb a steep incline even in the snow, and is able to balance itself on slippery ice. Dr Raibert is the so-called 'father of walking robots' in the U.S. and started the Leg Lab at Carnegie Mellon University in 1980 to explore walking machines.